According to  the issue of ::: has been open since "MW 1.17.0 and SMW 1.5.6 or SMW 1.6.1, probably happening to SMW 1.6.0 and SMW <1.5.6 though not tested.". @kghbln As the originator of https://phabricator.wikimedia.org/T32603 it would be nice if you could give this some testing (with/without NS, with/without interwikilink etc.) to avoid any regression on behalf of the :: syntax. I only added a few examples to parser-04-02-intext-colon-edge-case-parsing.json from the top of my head but maybe you can think of other combinations that are worthwhile to test. @jaakristioja If you feel up for the task you might want to test your [[Has IPv6::fc00:123:8000::/64]] example with this PR. @SemanticMediaWiki/testers Any testers for this one because I'd like to close this issue rather quickly. The first value is the directly stored on the second value is the queried value. Code is working as expected as is stores and outputs as is. 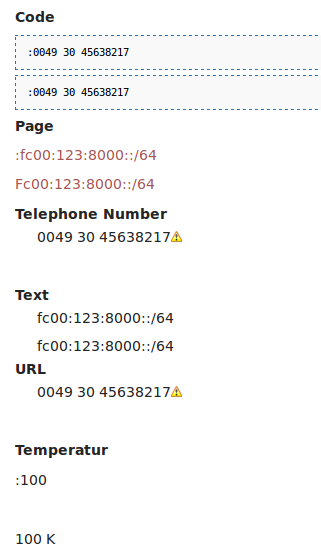 Telephone number, URL, Date and Email (last two not pictured) are working as expected and give a "Has improper value for"
Text is working as expected as it is stored and outputted as is. Here we see that MediaWiki takes the colon to indent. @mwjames What do you think of Page and Temperature? However, I do not think that they are a holdup for merging this. The InTextAnnotationParser doesn't make any validation of the input/output as this is part of the DataValue ( _wpg, _tem etc.) validation process. Types like URL, Email have specific validations in place (doing a preg_match for valid values) and therefore most likely filter those "unfit" values and return with an error / "Has improper value for". Page and temperature do not internally check for any specific value limitation therefore a preceding :is internally neglected or transformed to a valid (without :) value.